We have a lot to be grateful for at AdventureWomen. 2018 rings in our most successful year in the history of the company. We hope Susan would be proud, and we are so honored ... Read more. 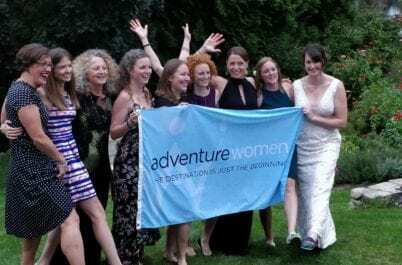 Our 2018-2019 survey of women adventure travel enthusiasts is a treasure-trove of information telling a wonderful story about why women like to adventure, how they define “adventure” and what they most like to do ... Read more. We love it when our guests take videos and send them into us. What fun they ... Read more. It’s October and most of us have women in our lives who are mired in the fight against breast cancer. For us, this scourge is a personal one because we lost the founder of ... Read more. When we think about indulgence, exercise and meditation aren’t necessarily the first things that come to mind. But sometimes “indulging ourselves” simply means doing what’s best for our physical and mental well-being. Too often ... Read more. One of the comments we frequently hear from our women travelers is how relaxed they say they feel when they return home from one of our trips. We’re sure this has a lot to ... Read more. Animals touch our hearts, emotions, senses, and curiosity. They connect us to nature like nothing else and provide a constant reminder of the preciousness of life. We are often blessed to encounter them on ... Read more. One of the strongest passions of our guests at AdventureWomen is for the wildlife we learn about and photograph on our trips around the world. Whether we are visiting the many unique species of ... Read more.